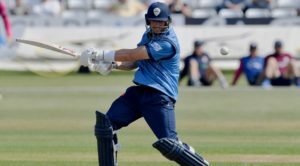 Ravi Rampaul took four wickets and Matt Critchley top-scored with 69, but Derbyshire slipped to a 165-run defeat in a 50-over friendly against Warwickshire at Edgbaston. 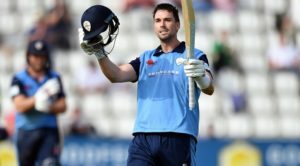 Sam Hain struck a fine double-century for the hosts in what proved to be a pivotal innings in the match, with Derbyshire unable to keep up with scoreboard pressure in their chase. Hain’s knock was the backbone of the innings after Rampaul had got Derbyshire off to a good start with the ball. The experienced quick opened the bowling and struck in the first over to remove Sibley (0), who had earlier won the toss and elected to bat first. Rampaul claimed his second in his next over, before he made it 30-3 in the ninth to give Derbyshire the upper-hand early on. Hain and Will Rhodes combined well to add 98 for the fourth wicket, as Logan van Beek looked to get the breakthrough in his first appearance for Derbyshire. But it was Critchley’s leg spin which broke the partnership, Rhodes bowled for 56. Aaron Thomason soon followed for 16 and Derbyshire had the hosts 176-5 with less than 20 overs remaining. Hain powered on and accelerated the run-rate, first reaching his century and then quickly onto a double-hundred in a stand with Liam Banks (77). The pair’s 208-run partnership powered Warwickshire to 388-6 from their 50 overs, setting Derbyshire a challenging total in the first 50-over test of the season. Luis Reece (4) fell early in the Derbyshire chase and despite 31 off 23 balls from Wayne Madsen, Derbyshire slipped to 56-2. Powerful hitting from Critchley, which included four sixes, got Derbyshire back in line with the required rate as both he and Godleman went past 50. 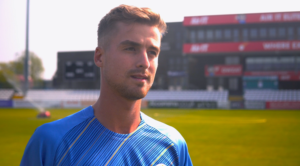 Critchley’s wicket, lbw to Thomson for 69, drained the momentum Derbyshire picked up in the middle overs and the two quick wickets of Godleman (59) and Lace (0) left the hosts in control after 28 overs. Alex Hughes made 15 and Harvey Hosein added 18, but the Derbyshire middle order fell away in the face of good bowling from Alex Thomson (3-43) and the visitors were well behind the rate at 207-8 in the 36th over. Hamidullah Qadri was run out for four and Thomason returned to the attack to remove Rampaul, Derbyshire all out for 223 in the 40th over. Derbyshire begin their 2019 Specsavers County Championship campaign against Durham, starting on Friday 5 April at The Pattonair County Ground.